"Get Together" at Locations of your choice...any Crew Member interested should contact us at: contact@usssandlancessn660.com. The Next Reunion: ??? The 2018 Reunion is history. 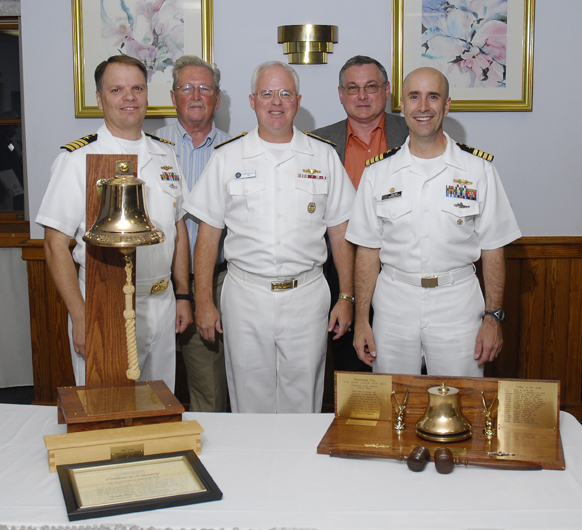 The photograph below is from our 2008 Reunion at Portsmouth, New Hampshire: Left to right are: Captain "Bud" Baker (Decommissioning CO) SAND LANCE, Phillip C. Brunson, YNC/SS, Ret. Yeoman of the Commissioning Crew, Admiral Joseph P. Mulloy, Deputy Chief of Staff Pacific Fleet and Keynote Speaker, Bernie O’Neill, IC3/SS.Commissioning Crew, Captain Mark Ginda, Commanding Officer of the U.S. Submarine Base New London, Groton Ct..